Target audience: Nonprofits, foundations, NGOs, social enterprises, cause organizations, cause advocates. Late last month I noticed that things looked different on Causes.com. The Nonprofit Technology Network (NTEN) began running a campaign to send 50 nonprofits to the Nonprofit Technology Conference, and the new layout and actions within Causes caught my eye. Causes features videos, commenting, sharing and full Facebook integration with the new Timeline. Causes looks and feels different from its previous iteration; it feels like a campaign center and no longer a Facebook add-on or a stand-alone online fundraising website. Raising funds for a cause isn’t just about asking for money. Successful fundraising campaigns include storytelling elements, peer to peer fundraising, and a campaign center. Causes has all of these elements built into its new platform, including video integration, petitions, sharing elements, polls, and commenting features. While Causes is still intimately tied to, and perhaps overly reliant on, Facebook as its primary social media messaging channel, the latest Causes iteration comes closer to fully engaging users and creating a campaign center than many other online fundraising platforms. 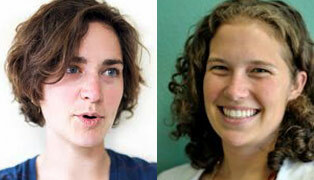 Sydney Fleischer and Susan Gordon of Causes. Please describe the platform’s new capabilities. On Causes, organizers can create campaigns around online pledges, fundraising asks, share-your-story campaigns, polls, quiz questions, and recruitment drives. We’re adding an online petitions tool very soon. Each of these actions is free to create, appears as a beautiful and easy-to-understand page, and is sharable through our integration with Facebook’s Custom Open Graph. How would you describe the newest iteration of Causes as opposed to the previous version? 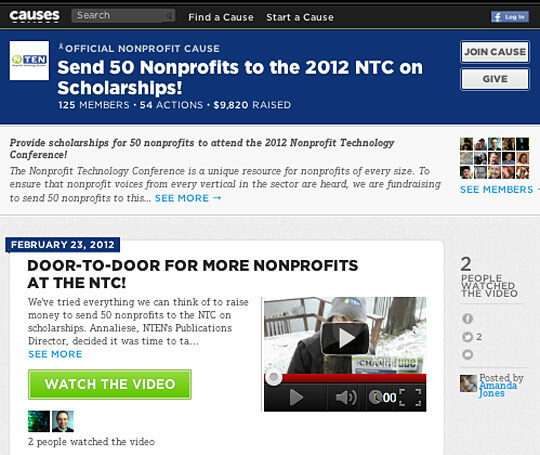 How do the changes fit into any trends you are seeing in online fundraising? The world is becoming more social every day and we’re seeing nonprofits try to utilize Facebook fan pages to grow their supporters. With Facebook’s Custom Open Graph, it’s now easier than ever to make fundraising go viral and I think nonprofits are trying to find a way to tap into that – and Causes is the best place to do so. And by the way, there’s still time to donate to the NTC scholarship campaign!Debra Askanase works with nonprofits and businesses to create engagement strategies that move people to action. She is a social media strategist and partner in Socialbrite. Visit her profile page, see her Community Organizer 2.0 blog, follow her on Twitter, contact Debra by email or leave a comment.